The Chedoke-McMaster Stroke Assessment (CMSA) is a screening and assessment tool utilized to measure physical impairment and activity of an individual following a stroke. The CMSA consists of two inventories. First is the Impairment Inventory, which assesses 6 domains (shoulder pain and stages of recovery of postural control, arm, hand, leg and foot). Each domain is scored on a 7-point scale (Stage 1 through 7, most impairment through to no impairment, respectively). Second is the Activity Inventory, formerly Disability Inventory, which assesses gross motor function (10 items evaluating rolling, sitting, transferring and standing) and walking (5 items). The 15 items are scored on a 7-point scale (1 through 7, complete dependence to independent, respectively). The CMSA was initially developed for the assessment of patients with stroke, its application has been more widely demonstrated, specifically for the Activity Inventory. This assessment tool was initially developed and validated for use with clients from an inpatient and day-hospital population. The initial development and validation studies were carried out on a Stroke Unit of the Chedoke Rehabilitation Centre. The Activity Inventory (formerly the Disability Inventory) has been shown to be a valid measure of functional change in clients in an acute neurological setting and for those with acquired brain injury. The Chedoke Assessment has been shown to function as discriminative, predictive, and evaluative measure. The minimal clinically important difference (MCID) of the Activity Inventory for neurological clients, including those with stroke, is 7 points when determined a physiotherapist, 4, 6, 7 and the MCID of the Activity Inventory is 8 points when determined by clients with stroke and their caregivers. In addition, predictive equations have been developed for both the Impairment Inventory and the Activity Inventory for use with patients with acute stroke8 or patients with stroke in the rehabilitation setting. The predictive equations can be found in Chapter 8 of the manual. The potential for using the Impairment Inventory scores as a predictor of independent ambulation has also been reported. Users of the CMSA should read the manual (linked below) prior to administration for the measures and be familiar with relevant administration, scoring and interpretation . No special training is required. Each dimension is measured on a 7-point scale, each point corresponds to seven stages of motor recovery. The 7-point scale for shoulder pain is based on pain severity. Activity Inventory: measures clinically important changes in the client's functional ability. This Activity Inventory is made up of a gross motor function and walking subscale. All equipment should be assembled ahead of time. Testing takes approximately 45 to 60 minutes to complete an assessment. It may not be feasible to complete the entire test in one session, however, effort should be made to complete the assessment within 2 days. Prior to assessment, the therapist should check relevant medical history and identify any condition(s) that may put a patient at risk. During assessment, the physiotherapist's instruction, whether words or gestures, should be clear and concise. To ensure thorough understanding, a movement task may be demonstrated, a patient's limb may be passively moved through a task or patient may be asked to perform a task on the uninvolved side. Once the patient understands, test instructions are given and movement task is observed. Tasks can only be attempted twice in the Impairment Inventory and once in the Activity Inventory. Standard starting positions are indicated at the top of each Score Form. If standard position is changed, indicate on form. Therapist may assist patient to starting position. When indicated may stabilize part being tested and may provide assistive support (only light support, no weight bearing) to patient so balance is not lost. When instructing patient, use simple commands. Modifications to instructions may be necessary to ensure patient understands required movements. 2 Involves facilitated active movement, in any range. Testing for tone - part passively put through available range of motion briskly with two repetitions. Visible muscle contractions qualify as movement. Facilitatory stimulus (i.e., manual stimuli). Maximum of two repetitions per task. Increased muscle tone alone. 3 to 7 Voluntary movement is tested. Facilitation techniques. 6 Full range of motion with near normal timing and coordination. 7 Full range of motion and rapid complex movements with normal timing. Timing and coordination of the task must be comparable to the uninvolved side. Movements not equal to uninvolved side. *Any tasks involved greater than half or full range of motion, compare with range on uninvolved side. Proceed with the shoulder pain assessment using the following descriptions. Match the descriptions with your impression of the client's pain. Record the stage of shoulder pain in the appropriate box on the Score Form. 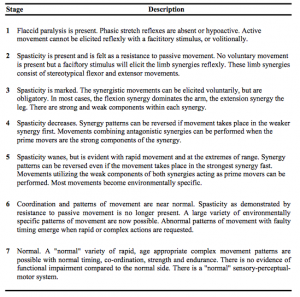 In the early stages, movement first occurs in limb synergy patterns. As stages progress, movement patterns out of the synergy in more complex and independent patterns. Postural control, arm, hand, leg and foot may recover at different rates. The stage of recovery of the proximal part of the limbs is often in a higher stage than the distal. Movements involving flexion are at a different stage of recovery than movements involving extension. Stage 1 - Flaccid paralysis is present. Phasic stretch reflexes are absent or hypoactive. Active movement cannot be elicited reflexly with a facititory stimulus, or volitionally. Stage 2 - Spasticity is present and is felt as a resistance to passive movement. No voluntary movement is present but a faciftory stimulus will elicit the limb synergies reflexly. These limb synergies consist of stereotypical flexor and extensor movements. Stage 3 - Spasticity is marked. The synergistic movements can be elicited voluntarily, but are obligatory. In most cases, the flexion synergy dominates the arm, the extension synergy the leg. There are strong and weak components within each synergy. Stage 4 - Spasticity decreases. Synergy patterns can be reversed if movement takes place in the weaker synergy first. Movements combining antagonistic synergies can be performed when the prime movers are the strong components of the synergy. Stage 5 - Spasticity wanes, but is evident with rapid movement and at the extremes of range. Synergy patterns can be reversed even if the movement takes place in the strongest synergy fast. Movements utilizing the weak components of both synergies acting as prime movers can be performed. Most movements become environmentally specific. Stage 6 - Coordination and patterns of movement are near normal. Spasticity as demonstrated by resistance to passive movement is no longer present. A large variety of environmentally specific patterns of movement are now possible. Abnormal patterns of movement with faulty timing emerge when rapid or complex actions are requested. 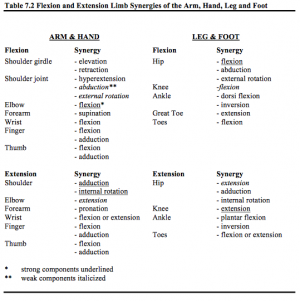 Flexion and Extension Limb Synergies of the Arm, Hand, Leg and Foot. Standard Starting Position: No shoes and socks. No standard position. Encourage good sitting posture (ie. with hips and knees at 90°) during testing when indicated. Start the assessment at Stage 4. Standard Starting Position: Sitting with the forearm in the lap or supported on a pillow in the lap in a neutral position, wrist at 0° and fingers slightly flexed. Sitting either unsupported over the side of the bed or plinth, or supported in a chair or wheelchair. Feet should be supported. Encourage good sitting posture during testing (ie. with hips and knees at 90°). Start the assessment at Stage 3. STAGE 1 - Unable to demonstrate at least two of the Stage 2 tasks. Standard Starting Position: Sitting with the forearm in the lap, or supported on a pillow, in a neutral position, wrist at 0° and fingers slightly flexed. The client can sit either unsupported on the side of the bed or plinth, or supported in a chair or wheelchair. Feet should be supported. Encourage good sitting posture for testing (ie. with hips and knees at 90°). Start the assessment at Stage 3. STAGE 2 - Support the limb as necessary while facilitating the movements. Scoring is based on a 7-point ordinal scale corresponding to the stages of recovery. The patient may attempt each task twice. Additional attempts that train the patient to achieve a task are not permitted. To receive credit, patient muscle complete task at least once. Place an ‘X’ in corresponding box for tasks completed. Impairment Inventory yields a total score of 42, with lower scores indicating greater impairment. Purpose of Activity Inventory is to assess the patient’s functional level. Therefore, focus on task accomplishment, not quality of movement. Independent Another person is not required for the activity (NO HELPER). 7 - Complete Independence All of the tasks which make up the activity are typically performed safely, without modification, assistive devices, or aids, and within reasonable time. 6 - Modified Independence Activity requires any one or both of the following to complete the task: an assistive device (i.e., foot orthoses, cane), or more than reasonable time (at least 3 times longer than normal). Dependent Another person is required for either supervision or physical assistance in order for the activity to be performed, or it is not performed (REQUIRES HELPER). The subject expends half (50%) or more of the effort. 5 - Supervision The client requires no more help than standby supervision, cueing or coaxing, without physical contact. 4 - Minimal Contact Assistance With physical contact the subject requires no more help than touching, and client expends 75% or more of the effort. 3 - Moderate Assistance The client requires more help than touching, or expends half (50%) or more (up to 75%) of the effort. The client expends less than half (less than 50%) of the effort. Maximal or total assistance is required, or the activity is not performed. 2 - Maximal Assistance The client expends less that 50% of the effort, but at least 25%. 1 - Total Assistance The client expends less than 25% of the effort, 2 persons are required for assistance, or the task is not tested for safety reasons. The therapist is expected to score each task, do not leave any item blank. If a task is not tested due to concerns for the patient's safety, assign a score of 1. Reproducibility of the CMSA has been established, however, reliability of all testers during administration varies. Recommendations are that facilities test interrater and intrarater reliability, as appropriate, in regards to administration and scoring guidelines and clinical application. Following testing, intrarater reliability was 0.93-0.98 and interrater reliability was 0.85-0.96 for Impairment Inventory and 0.98 for Activity Inventory. Test-retest reliability for the total scores ranged from 0.97 to 0.99. The CMSA has not been validated for use on patients who are less than one week post-stroke. Construct and concurrent validities were studied and confirmed that the Impairment Inventory total score was found to correlate with the Fugl-Meyer Test (r = 0.95, p < 0.001) and the Activity Inventory with the Functional Independence Measure (r = 0.79, p < 0.05). The minimal clinically important difference (MCID) of the CMSA for neurological patients, including those with stroke, is 7 points when determined by a physiotherapist and 8 points when determined by patients with stroke and caregivers. Overall, studies confirm that the CMSA yields both reliable and valid results. The CMSA can be used with confidence as both a clinical and a research tool that can discriminate among subjects and evaluate patient outcomes. MCID = 8 points (total CMSA via stroke patients) and 7 points (total CMSA via caregivers of stroke patients). > 9 on the leg and postural control scores indicates that the individual is able to ambulate independently. Excellent predictive validity, Physical Impairment Scale Leg postural control scores of >9 showed 100% sensitivity and 80% specificity in prediction of independent ambulation. ↑ 2.0 2.1 2.2 2.3 2.4 2.5 2.6 2.7 2.8 Gowland C, Stratford P, Ward M, et al. Measuring physical impairment and disability with the Chedoke-McMaster Stroke Assessment. Stroke 1993; 24 (1):58-63. ↑ Barclay-Goddard R. Physical function outcome measurement in acute neurology. Physiother Can 2000; 52(2):138-145. ↑ Crowe JM, Harmer D, Sharp J. Reliability of the Chedoke-McMaster Disability Inventory in Acquired Brain Injury. 1996. Canadian Physiotherapy Association Congress, Victoria, British Colombia, Canada. ↑ Huijbregts PJ, Gowland C, Gruber RA. Measuring Clinically Important Change with the Activity Inventory of the Chedoke-McMaster Stroke Assessment. Physiother Can Fall 2000. 295-304. ↑ Gowland C, Huijbregts C, McClung A, McNern A. Measuring Clinically Important Change with the Chedoke-McMaster Stroke Assessment. Can J Rehabil 1993; 7:14-16. ↑ Gowland C, Van Hullenaar S, Torresin W, et al. Chedoke-McMaster Stroke Assessment - Development, validation, and administration manual. Hamilton, Ontario, Canada: School of Occupational Therapy and Physiotherapy, McMaster University, Hamilton, Ontario; 1995. ↑ Stevenson TJ. Using Impairment Inventory Scores to determine ambulation status in individuals with stroke. Physiother Can Summer 1999; 168-174. ↑ Niam S, Cheung W, Sullivan PE, Kent S, Gu X. Balance and physical impairments after stroke. Archives of physical medicine and rehabilitation. 1999 Oct 1;80(10):1227-33.